Barbiturate is the name given to a drug made from barbituric acid, a combination of urea (a compound found in urine and other body fluids) and malonic acid. Barbiturates work by depressing (slowing down) the activity of nerves, muscles, heart tissue, and the brain. They are part of a class of drugs called the sedative-hypnotics, which can alter a person's mood and are generally prescribed for relaxation and sleep. Barbiturates act on the central nervous system and can produce effects ranging from mild sedation to coma (prolonged unconsciousness), depending upon the dosage given. If used improperly, barbiturates can even cause death. Barbiturates are not used for medical purposes as often as they once were. In many cases they have been replaced by the more effective and safer sedative-hypnotics called benzodiazepines (such as Valium and Librium). These tranquilizers are also addictive, however, and in some cases have become subject to abuse. Barbiturates can impair a person's ability to think rationally and to reason. They are is highly physically addictive (habit-forming). A person abusing barbiturates may exhibit symptoms similar to drunkenness, including loss of inhibition, loud or violent behavior, lack of muscle coordination, and depression. Withdrawal from barbiturate addiction can produce severe side effects. The addicted person may shake, be unable to sleep, feel anxious, and sometimes experience convulsions and delirium (a state of extreme mental excitement). Death can occur if a person stops taking barbiturates suddenly instead of gradually. If combined with alcohol, barbiturates can be particularly deadly. The first barbituric acid was prepared in 1864 by Adolf von Baeyer. His student, organic chemist Emil Fischer, worked with physiologist Joseph von Mering to introduce the first barbiturate derivative (something copied or adapted from existing material) for use as a sedative (a substance that reduces feelings of stress or excitement) in 1903. Fischer and von Mering produced 5.5 diethylbarbituric acid, a hypnotic (a substance that produces a sleep-like state) and sedative known by the trade names Barbital, Veronal, and Dorminal. By 1912 a phenylethyl derivative was developed and commercially introduced as Phenobarbital and Luminal. Since then, more than 2,500 barbiturates have been created. About 50 of these synthetic derivatives have been marketed. Doctors often prescribe barbiturates to help people relax during times of great stress or to help patients suffering from anxiety disorders. Because of possible side effects, barbiturates are usually given on a short-term basis, and the patient is closely monitored. Short-acting barbiturates such as thiopental are injected as general anesthesia before surgery. Pentobarbital and secobarbital are the barbiturates used most often to relax patients before surgery. A long-acting barbiturate, phenobarbital, is prescribed with other medicines to prevent epileptic seizures. Secobarbital was used as a medication to treat anxiety before tranquilizers were developed; it is still used for the short-term treatment of insomnia (the inability to sleep). 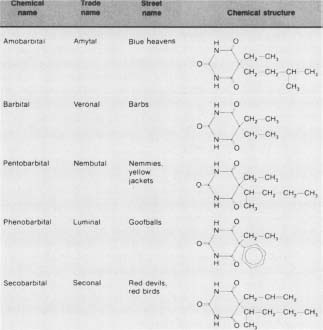 A chart of various barbiturate drugs and their chemical compositions. restful stage of sleep, known as REM (rapid-eye-movement). People are sternly warned not to drink alcohol while taking barbiturates, because mixing these two substances can prove fatal. Alcohol itself is a depressant (something that lowers the rate of body functions). Combining alcohol with a barbiturate can depress the nervous system to such an extent that it ceases functioning altogether.